Kappa Crucis Cluster also known as the Jewel Box, the Kappa Crucis Cluster NGC 4755 is one of the brightest in southern hemisphere skies. It is comparatively young, and contains a number of coloured stars. Kappa Cygnids Minor METEOR SHOWER, with a zenithal hourly rate (ZHR) less than 10, active between August 17 and 26, with a peak around August 20. The shower is noted for producing occasional bright, slow-moving FIREBALLS. Kapteyn, Jacobus Cornelius (1851-1922) Dutch astronomer renowned for his work in photographic astrometry and for introducing statistical methods in stellar astronomy. As the founder of the University of Groningen's Observatory in 1878, Kapteyn found himself with neither equipment nor research facilities. He therefore set about participating in international programmes of observation so as to accumulate large amounts of observational data, and developing mathematical techniques for reducing the data and statistical methods of handling them. A major collaboration (1885-97) was with David GILL to reduce the photographic positions of almost half a million southern-hemisphere stars. For this project, which yielded the cape photographic durchmusterung, Kapteyn invented a PLATE-MEASURING MACHINE that automatically converted photographic plate coordinates into real star positions and allowed accurate comparisons of stellar magnitudes from one plate to another. He made unprecedentedly accurate distance measurements for large numbers of stars in the Hyades and Perseus Double Cluster, allowing him to determine exactly which stars belonged to these clusters. In the course of 10,000 measurements of proper motions he discovered KAPTEYN'SSTAR, at a distance of only 12.7 l.y. the nearest subdwarf to the Solar System. Kapteyn's statistical investigations led to his discovery in 1904 of two 'star streams' in the Milky Way moving in opposite directions. Later astronomers such as Jan oort and Bertil LINDBLAD concluded that this streaming meant that the Galaxy had DIFFERENTIAL ROTATION about its central nucleus. With Pieter Johannes van Rhijn (1886-1960), Kapteyn studied the distribution of stars in the Galaxy. Kennedy Space Center The 1994 November 3 launch of Atlantis on Space Shuttle Mission STS-66. 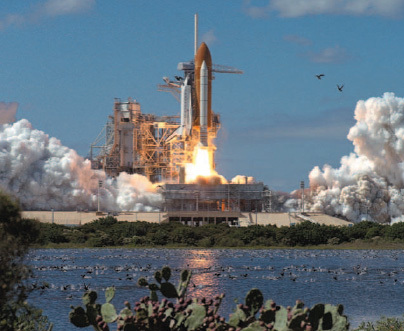 NASA's fleet of four Space Shuttles is based at the Kennedy Space Center. Kennedy Space Center The 1994 November 3 launch of Atlantis on Space Shuttle Mission STS-66. NASA’s fleet of four Space Shuttles is based at the Kennedy Space Center. Keeler, James Edward (1857-1900) American astronomer who was director of both the allegheny observatory (1891-98) and the lick observatory (1898-1900). He specialized in spectroscopy, the study of nebulae and planetary research. His spectroscopic study of Saturn (1895) revealed different Doppler shifts in the inner and outer parts of the ring system, showing that it did not rotate at a single rate, supporting the theory of James Clerk maxwell that the rings were composed of many individual particles. Kellner eyepiece Eyepiece with large eye relief, which makes it widely used for binoculars as well as telescopes. It is essentially a ramsden eyepiece with one element replaced by an achromatic doublet. Like the Ramsden, the Kellner is prone to ghosting, caused by internal reflections within the eyepiece. It is, however, popular with many observers. It was invented in 1849 by the German optician Carl Kellner (1826-55). Kelvin, Lord (William Thomson) (1824-1907) Scottish mathematical physicist who gave his name to the Kelvin temperature scale, based on absolute zero. When just fifteen years old, the University of Glasgow awarded Kelvin its Gold Medal for his 'Essay on the Figure of the Earth', an amazingly sophisticated work on geo-detics, and in 1846 he was elected professor there. He proposed his temperature scale in 1848 during the course of thermodynamical studies with the physicist George Gabriel Stokes (1819-1903). Apart from his major influence on physics, Kelvin made contributions to astronomy. He analysed the second law of thermodynamics, concluding (1849-52) that if entropy always increases, this would result in the heat death of the universe, from which it would not be possible to observe or measure any information about its physical state. He made one of the first properly scientific attempts at estimating the age of the Earth, based on known cooling rates of materials, although his result (20-400 million years) was far too low. Kennedy Space Center (KSC) national aeronautics and space administration (NASA) facility for the preparation and launch of US manned space missions and its spaceport technology centre. Located at the Cape Canaveral Spaceport, Florida (on Merritt Island, north of Cape Canaveral itself), the site was selected for guided missile tests in 1947, but the main complex was commissioned in 1961 as the launch facility for the apollo programme. It was named after former president John F. Kennedy. The KSC is NASA's centre of excellence for launch and payload processing systems and the lead centre for the management of expendable launch vehicle services. It is best known for handling the check-out, launch and landing of the space shuttle and its payloads. The hubble space telescope, the chandra x-ray observatory and the modules of the international space station all passed through the facility. Kennelly-Heaviside layer (Heaviside layer) Term formerly used to denote either the whole of Earth's ionosphere or a single region (the e-layer) within it. After Guglielmo Marconi's successful transmission of radio signals across the Atlantic Ocean, Arthur Edwin Kennelly (1861-1939) and Oliver Heaviside (1850-1925) suggested that an electrically conducting region existed in the atmosphere at high altitudes capable of reflecting radio waves back to Earth. Kepler, Johannes (1571-1630) German astronomer and mathematician, remembered for his three laws of planetary motion. A convert to Copernicanism, he became in 1600 assistant to Tycho brahe, who died the next year. Kepler then began the task of completing tables of predicted planetary positions begun by Tycho. From Tycho's accurate observations Kepler concluded that Mars moves in an elliptical orbit, and went on to establish in 1609 the first of his laws of planetary motion (kepler'slaws). Speculations on magnetism led him to the second of these laws, and his desire to match celestial and musical harmony led to the third, published in 1619. The Rudolphine Tables, based on Tycho's observations and Kepler's laws, appeared in 1627 and remained the most accurate planetary tables until the 18th century. Kepler also studied the supernova of 1604 (known as kepler'sstar), and made important contributions to optics and the theory of the telescope. Johann von Kappel (though he is now always known by the Latinized version of his name) was born at Weil der Stadt, near Stuttgart. His father was a mercenary who was apparently killed while fighting in Holland when Johannes was only five, and the boy was raised by his mother at her father's inn. A precocious child, Kepler obtained a scholarship in 1587 to Tubingen University. There he showed himself to be an able mathematician, and though he began studying Protestant theology after gaining his master's degree, he was nominated provincial mathematician and teacher of mathematics at the Lutheran school in Graz. Despite his mixed views on astrology (he called it 'the foolish little daughter of astronomy'), Kepler followed fashion and provided astrological predictions about the weather, peasant uprisings and Turkish invasions - all of which happened to be fulfilled. Casting horoscopes would later bring Kepler the income he needed to pursue his astronomical work. At Tubingen, he was influenced by the professor of astronomy, Michael Mastlin (1550-1631), who was well versed in Copernicus' heliocentric theory. Kepler was fired with enthusiasm for the Copernican idea that the Earth and the other planets orbit the Sun. Despite being twice excommunicated from the Lutheran Church, Kepler remained a lifelong believer in a divine plan for the cosmos, and came upon what seemed to him a proof of the idea. He found that the sizes of the spheres upon which the planets were then supposed to be carried were such that the five regular solids of classical geometry could be inserted between them, in most cases almost exactly. Between the spheres of Saturn and Jupiter, a cube could be fitted; between Jupiter and Mars, a tetrahedron (solid with four faces); and so on. This grand design was published in 1596 as Mysterium cosmographicum ('The Mystery of the Universe'), establishing Kepler's reputation as a brilliant mathematician. Religious upheavals in central Europe forced Kepler to leave Graz, and he visited Tycho in Benatky, outside Prague. Kepler recognized the superb precision of Tycho's observations, and that their mathematical analysis would improve planetary theory. Tycho did not accept the Copernican theory (see TYCHONIAN SYSTEM), but was so impressed with Kepler's abilities that in 1600 he invited him to become his assistant. Kepler accepted and, when Tycho died the next year, was appointed his successor as Imperial Mathematician. In 1604 a supernova appeared in the constellation Ophiuchus, and in De stella nova Kepler described its astronomical and astrological aspects his duties as Imperial Mathematician required him to provide the Holy Roman Emperor Rudolf II with astrological interpretations of astronomical phenomena. During this period Kepler continued his analysis of Tycho's observations of Mars, which had the greatest eccentricity, and hence most difficult orbit to explain, of all the known planets except Mercury. Kepler found that Tycho's accurate data fitted neither the original version of the Copernican theory or Tycho's own planetary scheme; after years of painstaking calculations, he concluded in 1609 that Mars orbits the Sun, not in a perfect circle but in an ellipse. This was a fundamental break with tradition, for previously everyone had followed the Greeks in believing that the planets move in circular orbits and, moreover, at an unvarying rate. Kepler also showed this to be untrue. The orbital velocity of Mars was greatest when closest to the Sun in its elliptical path, at perihelion, and slowest when at its most distant, at aphelion. Kepler went on to examine Tycho's body of observations to determine whether the other planets moved in elliptical orbits. He found that they did a result he formulated in what we now know as Kepler's first law of planetary motion. Having taken the important step of letting observations determine his planetary theories, Kepler next sought a physical explanation for the planets' elliptical orbits. He speculated about a magnetic force emanating from the Sun, sweeping the planets round as the Sun rotated. This was incorrect, but it led Kepler to formulate an equation for orbital velocity which, though accurate only at aphelion and perihelion, brought him to his second law of planetary motion: that the line from Sun to planet (the radius vector), sweeps out equal areas of the ellipse in equal times. He published these first two laws in Astrono-mia nova (1609). With the idea of a divinely harmonious Universe in mind, he managed to fit the different orbital velocities at aphelion and perihelion to the musical scale in an attempt to achieve a 'celestial harmony', and derived what seemed to him an example of divine law - the relationship between a planet's distance from the Sun and the time it takes to complete an orbit. First appearing in Har-monices mundi ('Harmonies of the World', 1619), Kepler's third law states that for any two planets the ratio of the squares of their orbital periods equals the ratio of the cubes of their mean orbital radii. The seven-volume Epitome astronomiae Copernicanae (1617-21) was Kepler's longest and most influential book. Reprinted in 1635, it was the one of the few accessible systematic accounts of the Copernican theory. It also contained detailed expositions of Kepler's laws and his theory of the Moon's motion. His Rudolphine Tables (1627) are generally regarded as the first modern truly scientific ephemeris of planetary positions: they synthesized the first two laws of planetary motion with Kepler's reductions of Tycho's data, and remained in use until the 18th century. Kepler wrote two important works on optics, including Astronomia pars optica (1604), which contains the first application of the technique known as ray-tracing to analyse optical systems. The second, Dioptrice (1611), was a comment on GALILEO's Siderius nuncius in which he proposed his own design of telescope (now called the Kep-lerian telescope, still used in opera-glasses) which employed two convex lenses. His reviews of Galileo's observations of Jupiter's moons caused Kepler to coin the term 'satellite' (1610) to describe these minute bodies. Kepler wrote one of the first science fiction novels, the Somnium, which describes an imaginary trip to the Moon. All his life Kepler suffered from poor health. When his mother was tried for witchcraft, he went to help her, defending her with great success to his own advantage as well as hers, for her conviction would have damaged his career. Kepler ended his days in Regensburg, chronically short of money because of delays in the payment of his Imperial stipend. Kepler Lunar crater (8°N 38°W), 35 km (22 mi) in diameter, with rim components reaching 3050 m (10,000 ft) from its floor. It is a recent complex crater, with central peaks and wall terracing. Kepler still has a brilliant RAY system, which is most well developed towards the west; it is best observed at high Sun angles. The inner part of the EJECTA blanket is also easily identifiable, and best observed at low Sun angles. Kepler's laws Three fundamental laws of planetary motion, announced by Johannes KEPLER in 1609 and 1618, deduced from observations made by Tycho BRAHE. 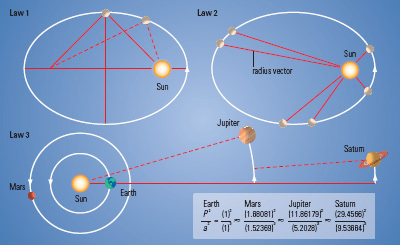 (1) The planets move in elliptical orbits, the Sun being situated at one focus of the ellipse. (2) The radius vector, an imaginary line joining the centre of the planet to the centre of the Sun, sweeps out equal areas in equal times (thus, a planet moves fastest when closest to the Sun). (3) The squares of the sidereal periods of the planets are proportional to the cubes of their mean distances from the Sun. Kepler’s laws Planetary motions around the Sun are described by Kepler’s three laws. Law 1 states that each planet’s orbit is an ellipse with the Sun at one focus. Law 2 states that the radius vector sweeps out equal areas in equal times, regardless of position in the orbit. Law 3 relates the square of the planets’ sidereal periods to the cube of their distances from the Sun. These laws, which Kepler saw as of divine origin, disproved the PTOLEMAIC SYSTEM and vindicated the COPER-NICAN SYSTEM. The laws apply to all bodies in closed orbits around the Sun, and to satellites orbiting planets. Strictly, the laws only apply in the absence of perturbations by other planets and other sources. Kepler's Star Supernova that appeared in 1604 in OPHIUCHUS, only 32 years after TYCHO'SSTAR. No galactic supernova has definitely been seen since that time, although the supernova remnant known as Cassiopeia A has been identified with a star observed by John Flamsteed in 1680. Reaching an apparent magnitude of — 3, the 1604 star was extensively observed in Europe and the Far East. Both Johannes KEPLER and the official astronomers of Korea made fairly systematic brightness estimates for up to a year. The smooth light-curve closely resembles that of a Type I supernova. Accurate measurements by both Kepler and David fabricius fixed the position of the star to better than one arcminute. The remnant is a powerful source of electromagnetic radiation. Keyhole Nebula (NGC 3324) Region of dark nebulosity seen in silhouette against the eta carinae nebula (RA 10h 44m.3 dec. -59°53'). It was named after its shape by John herschel in the 19th century. It covers an area of about 3'X 11'. Keystone Popular name for the distinctive quadrilateral marked out by the four stars e, Ј, i) and t Herculis. The Keystone represents the pelvis of Hercules. kiloparsec Unit of distance measurement equivalent to one thousand parsecs; a parsec being the distance at which a star would subtend a parallax of one arcsecond. kinematics Branch of mechanics devoted to the study of the motions of bodies. Forces are not considered within kinematics but form a separate branch of mechanics called dynamics. Thus, for example, the kinematic parallax (also known as the moving cluster method) of stars is obtained by knowing only the proper motions of stars in a star cluster. kinetic energy (KE) energy that a body possesses because of its motion. Kirch family German astronomers, noted for compiling calendars, who played a leading role in founding astronomy in what was then Prussia. Gottfried Kirch (1639-1710), who was taught by Johannes hevelius, was the first astronomer at the Berlin Observatory (1700). He made the calculations for, and published, many astronomical ephemerides and calendars, and made detailed observations of the 1699 comet. Gottfried's wife, Maria Margarethe Kirch (1670-1720), assisted her husband in much of his ephemeris and calendar work, and also discovered a bright comet in 1702. Maria had taken up astronomy before meeting her husband, learning the science from the self-taught Christoph Arnold (1650-95). After her husband's death in 1710, Maria worked with her son, Christ-fried Kirch (1694-1740), at the Berlin Academy. Christfried carried on the calendrical work of his parents and restored the observatory of Hevelius, from where he discovered the bright comet of 1723. He was assisted in his astronomical computations by his mother and his sister Christine Kirch (c.1696-1782). Kirchhoff, Gustav Robert (1824-87) German physicist, born in Konigsberg (in modern Russia), a leading physicist of his time who, with Robert Wilhelm Eber-hardt Bunsen (1811-99), developed the techniques and principles of astronomical spectroscopy. After teaching at the universities of Berlin and Breslau, Kirchhoff followed Bunsen to Heidelberg to become professor of physics. The two men established the principles of analysing absorption and emission spectra, but it was Kirchhoff who saw its potential for astronomy. Even more relevant to astrophysics are his three gas laws, all announced in 1860. The first provides that a dense object produces a continuous 'blackbody' spectrum when heated. His second gas law says that a low-density excited gas will produce a bright emission-line spectrum as electrons lose energy. Kirchhoff's third gas law states that a continuous spectrum source will produce dark absorption lines as it passes through a cooler low-density gas. Using these laws Kirchhoff discovered the elements caesium and rubidium, named for the blue and red colours of their emission lines. Applying his gas laws to the solar atmosphere, Kirchhoff reached four important conclusions: (1) solar sodium atoms produce the orange-yellow Fraunhofer emission lines; (2) the Sun's light is produced by a high-temperature gas; (3) dark absorption lines must come from a hot gas, but one which is cooler than the interior layers of our star; and (4) the dark absorption lines in the solar spectrum originate as the cooler chromosphere absorbs photons from the photosphere below. Kirchhoff's laws Laws of spectroscopy discovered by the German chemists Gustav kirchhoff and Robert Bunsen (1811-99) and published in 1856. In essence they state that an incandescent solid, liquid or high-density gas emits a continuous spectrum, whereas a low-density gas emits or absorbs light at particular wavelengths only. Each element has its own characteristic pattern of lines. Thus stellar spectra have absorption lines arising from their low density outer layers; gaseous nebulae have emission line spectra. Kirkwood, Daniel (1814-95) American expert on celestial mechanics who discovered (1866) the gaps in the asteroid belt, located at 2.5, 2.95 and 3.3 AU, now known as kirkwood gaps. While classifying the asteroids into families defined by their orbital parameters, Kirkwood noticed, as early as 1857, that very few asteroids had orbits in certain regions. He was able to show that perturbations induced by the powerful gravity of Jupiter preclude long-term stable orbits at the distances corresponding to these gaps. Kirkwood applied this same analysis to explain the gaps in Saturn's ring system, calculating the tendency of Saturn's satellites to constrain ring particles in well-defined zones, while excluding them from the gaps. Kirkwood gaps Largely vacant regions within the main belt of asteroids, in terms of their heliocentric distances, kept clear by gravitational perturbations caused by Jupiter. These distances are equivalent to orbital periods that are simple sub-dividers of Jupiter's period, resulting in resonance effects that repel asteroids. These gaps were noticed by Daniel kirkwood in 1857, their explanation in terms of celestial mechanics coming a decade later. Kitt Peak National Observatory (KPNO) US national research facility for ground-based optical astronomy. 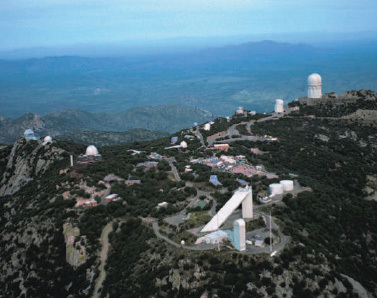 Located in the Quinlan Mountains 90 km (55 mi) southwest of Tucson, Arizona, Kitt Peak was selected by the National Science Foundation (NSF) as an observatory site in 1958 after a nationwide site survey. It is operated jointly by the NSF and the association of universities for research in astronomy. KPNO is one of the four divisions of the national optical astronomy observatory, and has headquarters in nearby Tucson. It now hosts the most diverse collection of telescopes on Earth for optical and infrared astronomy and daytime studies of the Sun. Of these, KPNO itself operates the 4-m (158-in.) Mayall Telescope (dedicated in 1973), the 3.5-m (138-in.) wiyn telescope (on behalf of the WIYN Consortium) and a 2.1-m (84-in.) reflector optimized for infrared as well as optical observations. Kitt Peak National Observatory An aerial view of Kitt Peak, showing the many telescopes sited there. Largest, at the top right, is the 4-m (158-in.) Mayall Telescope. The triangular building in the foreground is the McMath–Pierce Solar Facility, the world’s largest solar telescope. As well as these large telescopes, there is a 0.9-m (36-in.) instrument (known as the Coude Feed Telescope) which feeds light to the main spectrograph at the 2.1-m telescope, another 0.9-m (36-in.) telescope and the Burrell Schmidt telescope. A further 16 optical telescopes and two radio telescopes share the site; these are operated by the national solar observatory, the national radio astronomy observatory and various other university consortia. Largest among them are the steward observatory's 2.3-m (90-in.) Bok Telescope (1969) and the 2.34-m (92-in) Hiltner Telescope, built for the Michigan-Dartmouth-MIT Observatory in 1986. Kleinmann-Low Nebula Nebula containing several strong infrared sources; it is situated behind the orion nebula. It was first observed in 1967 by the American astronomers Douglas Kleinmann (1942- ) and Frank Low (1933- ). The Kleinmann-Low Nebula is a large dusty star-forming region. It has several distinct infrared sources within it, including the becklin-neugebauer object. These sources are thought to be individual protostars. Strong outflows within the nebula may be powered by the strongest of the infrared sources, IRc2. Kleopatra main-belt asteroid; number 216. Radar imaging has shown that Kleopatra has a bizarre shape somewhat like a dog's bone, 217 km (135 mi) long and 93 km (58 mi) wide. Kochab (Kocab) The star p Ursae Minoris, visual magnitude 2.08, distance 126 l.y., spectral type K4 III. Its name is of uncertain derivation. Konkoly Observatory National observatory of Hungary, operated by the Hungarian Academy of Sciences. Its benefactor, Miklos Konkoly-Thege (1842-1916), donated his astronomical instruments to the state in 1899, and the observatory was established in Budapest after World War I. A 0.6-m (24-in.) reflector, still in use, began operations in 1928. In 1958 a dark-sky site, Piszkestetoi Observatory, was set up in the Matra Mountains about 120 km (75 mi) north-east of Budapest; three telescopes are currently operated there, including a 1.0-m (39-in.) built in 1974. Kopff, Comet 22P/ Short-period comet discovered photographically by August Kopff(1882-1960), Heidelberg, Germany, on 1906 August 23. The orbit has been modified by passages close to Jupiter in 1942 and 1954, and it has a current period of 6.45 years. It was last seen, as a diffuse magnitude +7.0 object, in 1996. Kohoutek, Comet (C/1973 E1) Long-period comet discovered in 1973 by Lubos Kohoutek (1935- ), Hamburg, Germany, on photographic plates. Its relative brightness at the time of discovery, while still as distant from the Sun as Jupiter (5 AU), engendered forecasts that Comet Kohoutek would be a spectacular object. Kraus, John D. (1910- ) American radio astronomer noted for his design of radio antennae and receivers and his work with Ohio State University's Big Ear radio telescope. Big Ear, built near Delaware, Ohio (1956-63), consisted of a large, flat surface tilted about its horizontal axis and reflecting signals to a fixed paraboloidal reflector. It was demolished in 1998. From 1965 Kraus used Big Ear to make the most detailed map of the radio sky in history, discovering over 20,000 new sources of radio waves. In 1970, after completing the 'Ohio Survey', Kraus and his collaborators used Big Ear to search for extraterrestrial life. KREEP Specific type of lunar material enriched in potassium (K), rare-earth elements (REE) and phosphorus (P). It was first found among the samples brought by apollo 12 astronauts. In its chemistry and bulk mineralogy KREEP is a variety of lunar basalt. It is believed to be formed from melt residue from the crystallization of large masses of crust and upper mantle materials of the Moon. Kreutz sungrazer Any of a group of comets with similar orbits that at perihelion lie within 0.01 AU (1.5 million km/1 million mi) of the Sun. The group was first recognized by the German astronomer Heinrich Carl Friedrich Kreutz (1854-1907) in 1888. Kreutz sungrazers have retrograde orbits with periods of 500-1000 years; there are two principal subgroups. 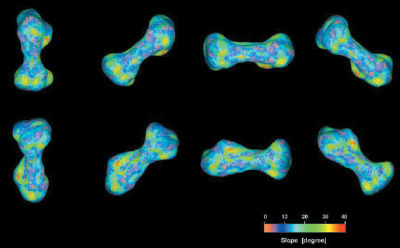 Kreutz sungrazers are believed to result from fragmentation in the remote past of a single large progenitor comet. The numerous smaller members of the group have been produced from further break up of the parent comet. SOHO spacecraft coronagraph observations have revealed large numbers of very small fragments on Kreutz sungrazer orbits. Larger fragments have produced some of the brightest comets in history, with C/1965 S1 ikeya-seki being a noteworthy example. Their orbital inclination of 141°.9 means that Kreutz sungrazers are usually best observed after perihelion from southerly latitudes. Many sungrazers fail to survive the intense solar heating experienced close to perihelion. K star Any member of a class of yellow-orange stars, the spectra of which are characterized by weak hydrogen lines, with strong ionized calcium lines (Fraunhofer H and K) in the warmer K stars, and powerful neutral calcium (Fraunhofer g) and neutral sodium (Fraunhofer D) in the cooler ones. Molecular bands of CH (Fraunhofer G) and CN are also strong. Main-sequence dwarfs range from 4000 K at K9 to 5200 K at K0, with zero-age masses from 0.5 to nearly 0.9 solar mass, and luminosities from 0.1 to 0.5 solar. Dwarf lifetimes are longer than the age of the Galaxy. K giants and supergiants (because of lower densities typically 600 K cooler than the dwarfs) are distinguished from dwarfs by the prominent weakening of the CN absorption bands. Stellar luminosities are also found from the 'Wilson-Bappu effect', in which luminosities are directly tied to the width of a chromospheric emission line set within the broad ionized calcium H and K absorptions. K supergiants, which are rare because of rapid evolution through the class, can range to high masses. Prominent among K giants are visually numerous helium-burning 'clump stars' of modest mass, which on the hertzsprung-russell diagram clump together near absolute magnitude zero. K subdwarfs have weakened metal lines and lower metal abundances. Except where they are members of short-period binary systems, most K stars are slow rotators. Some K giants are carbon rich: class R carbon stars, which begin at G5 temperatures, track fairly well the range of class K. Moderate carbon abundances combined with heavy-element excesses are found in the barium stars, which are enriched as a result of mass transfer from companions that have evolved to white dwarfs. KO III, Arcturus K1 III, Epsilon Pegasi K2 Ib, Alpha Centauri-B K1 V and Epsilon Eridani K2 V.
Kuiper, Gerard Peter (1905-73) Dutch-American astronomer (born Gerrit Pieter Kuiper) responsible for revitalizing Solar System astronomy in an era dominated by stellar and galactic research. After studying astronomy at the University of Leiden with Bart bok, Kuiper emigrated to the United States in 1933, joining the staff of Lick Observatory, where he concluded from studying stars of large parallax that at least half of all nearby stars are double or multiple systems. He invented the term 'contact binary' to describe the very close double star beta lyrae. Moving to the Yerkes Observatory in 1938, he tightened the definition of the mass-luminosity relation, and concluded that white dwarfs are highly dense objects that behave differently from main-sequence stars. He was later director of Yerkes and of the McDonald Observatory, established by Yerkes in the darker skies of west Texas in 1939. During World War II Kuiper used the large telescopes at Yerkes and McDonald for photographic studies of the planets and their satellites at wavelengths in the visual and near-infrared; his 1944 discovery of methane on Titan proved for the first time that planetary satellites could have atmospheres of their own. A string of Solar System discoveries followed: a tenuous CO2 atmosphere on Mars, a fifth satellite of Uranus (Miranda), a second satellite of Neptune (Nereid) and methane in the atmospheres of Uranus and Neptune. In 1960 he fulfilled an early ambition to set up an institute devoted to Solar System studies - the lunar and planetary laboratory (LPL) at the University of Arizona. Intimately involved in most of NASA's space programmes, he was Chief Experimenter for the pioneering Ranger missions to the Moon. First at Yerkes and then at LPL, Kuiper directed the preparation of several important photographic lunar atlases that ensured the choice of safe sites for the Apollo landings. His search for superior observatory sites led to the cerro tololo inter-american observatory in Chile and mauna kea observatory in Hawaii. He also initiated the use of telescopes in high-flying aircraft for infrared observations (see kuiper airborne observatory). Kuiper Airborne Observatory (KAO) Lockheed C-141 transport aircraft containing a 91-cm (36-in.) short-focus Cassegrain reflecting telescope designed for infrared astronomy. The KAO was named in honour of Dutch-American astronomer Gerard kuiper. It was operated from NASA's ames research center in California from 1975 to 1995. The KAO was used to discover the rings of Uranus, water vapour in Jupiter's atmosphere and Halley's Comet, condensed cores in bok globules, and more than 60 previously unobserved spectral features in the interstellar medium. Its successor is the stratospheric observatory for infrared astronomy (SOFIA). Kwasan and Hida Observatories Observatories of Kyoto University, Japan. Kwasan Observatory dates from 1929, when it was established on Mount Kwasan in Kyoto city for solar and stellar research. Increasing light pollution led to Hida Observatory being set up in 1968 at Kamitakara, 350 km (220 mi) north-east of Kyoto, at an altitude of 1275 m (4180 ft). Hida has a 0.65-m (26-in.) refractor (the largest refractor in Asia, built in 1972), a 0.6-m (24-in.) reflector and the 0.6-m (24-in.) Domeless Solar Telescope (DST), built in 1979.